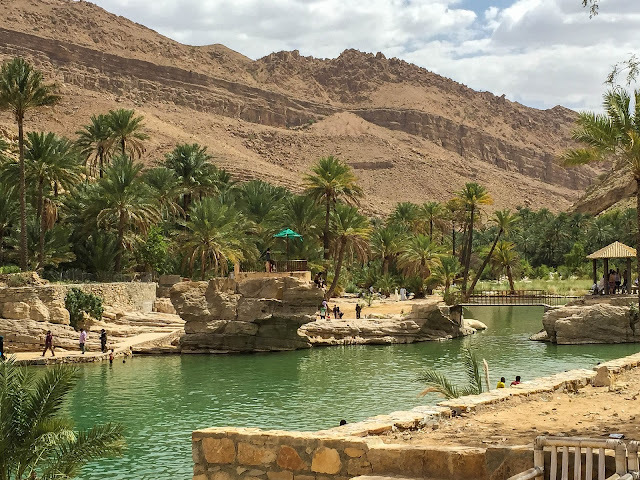 Oman is full of wadis, dry riverbeds that fill with water during the rainy season, but Wadi Bani Khalid truly is a desert oasis. A dam near the park entrance ensures year round watering holes upstream. With a restaurant and shaded picnic tables, it is a favorite with the locals and conservative swimwear is requested. We found this to be essential as even in my one piece bathing suit and shorts I was still whistled at, stared at, and cat called. 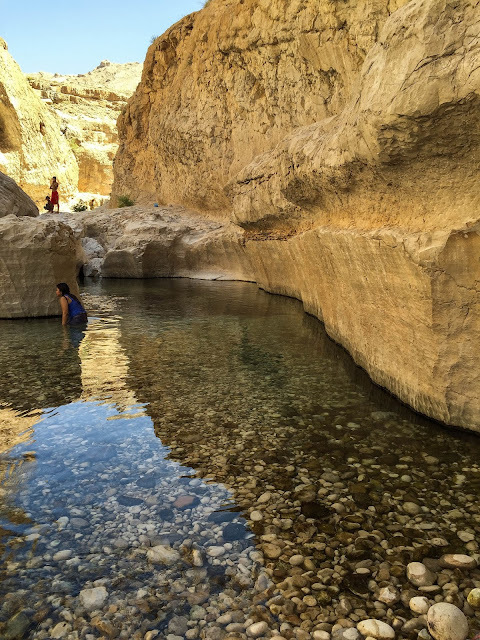 Location: 203km south of Muscat about 25km off Highway 23. You do not need a 4x4 to get there, but it is too far from Muscat for a practical day trip. Services: You can bring in your own picnic supplies or there is a restaurant serving a traditional buffet, soda, water and coffee. Tip: Women should wear one piece suits or a t-shirt. 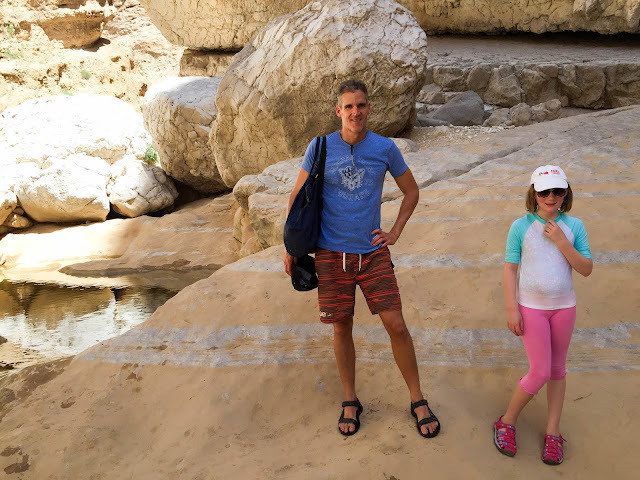 Wear sandals for climbing on rocks. Bring water, sunscreen and a sun hat--the heat is a killer! As there aren't really "directions" online to the wadi, I am including a few road sign photos to serve as visual cues. The first one is what you will see when you leave highway 23. Once passing the green sign you will travel into a village where you will see the first brown sign--Turn left here. Then just as you begin to get nervous that you've somehow missed it, this reassuring sign appears and a few minutes later you will dead end into a parking lot. Park here and walk into the wadi. The main entrance is about 1km inland. 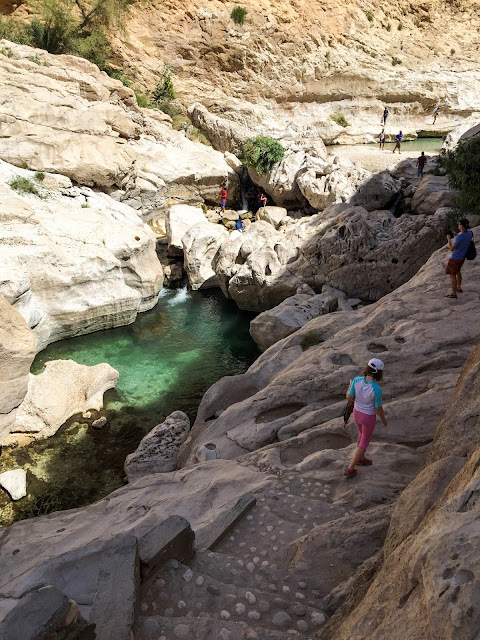 The further back in the wadi you go the clearer the water becomes so we walked until we settled on the perfect swimming hole just deep enough to jump in, a small waterfall to climb on and a perfect ledge from which I could perch. We hiked a bit beyond the water pools to an area that had completely dried up. Notice the mud markings as the water slowly evaporated. Earlier in the year this area would have been 10 feet deep in some places. 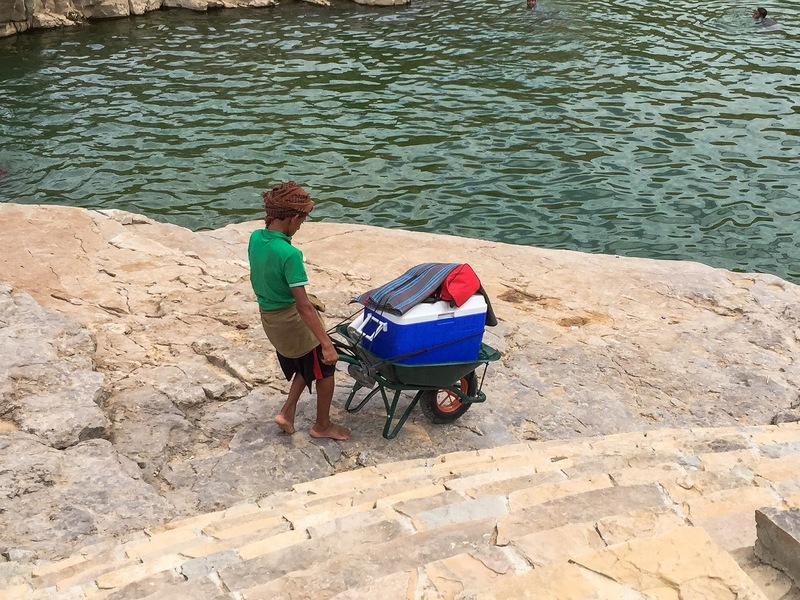 This little entrepreneur stands in the parking lot offering to haul your picnic supplies up the path to the wadi entrance. Interestingly though, the only females we saw swimming were Western women. Loads of Middle Eastern men, but no women which might account for all the unwanted attention I received. It was a super enjoyable day though, so don't be deterred, we'd go again in a heart beat. It's an amazing locale. I can imagine the old Bible stories on tv with such a setting. How are you enjoying the Middle East so far? The transition has been tough. 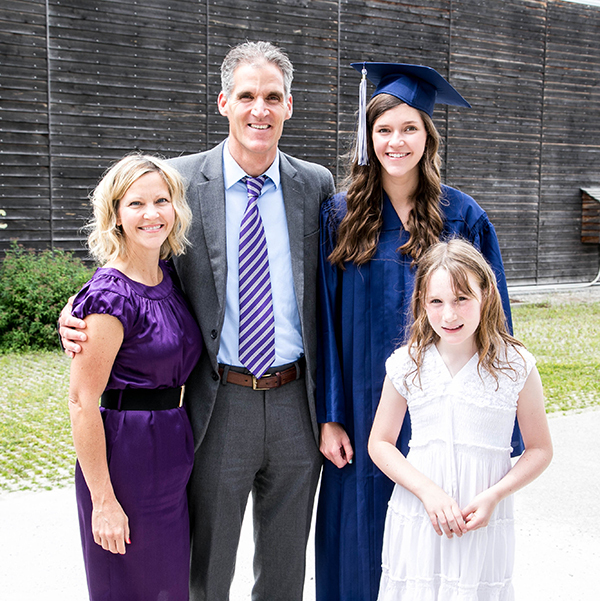 It is a real game changer to live in a place where there is a tangible loss of individual freedom. I am hopeful things will get better as the weather cools and we can get out of the house more. Beautiful! How are the temps right now? Sooooo interesting! I just love "tagging along" here on your wonderful life experiences! A different world from the S. of Germany (have been there several times) ! Hope your adjustment will go smooth and quickly!